The Polarizer devices consist of a Lakhovsky-type coil embedded in a special resin-like material. The copper coil, invented by Russian engineer Georges Lakhovsky, operates on the principle that when outside frequencies are in harmony with the body, the cells become stronger. If outside frequencies (such as those produced by electrical devices) are of a different frequency, the cells weaken. The coil captures frequencies from living cells, boosting immune response and strengthening cells. The technology protects biological systems from harmful radiation, such as that produced by microwaves, computers, TVs, fluorescent lighting, radar, broadcasting stations and devices powered by AC electric. This disc is designed for personal protection anywhere you go. Simply place it in your pocket or carry in your purse. Measures approximately 1½” in diameter. Please note that design varies depending on current stock. Optional carry pouch. 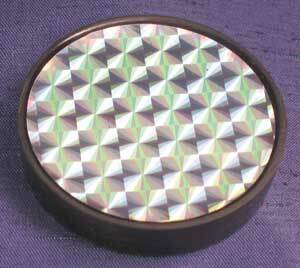 Polarizer also makes the Cone for use in the home or office.